I'm back from a cross-country road trip, so Project 50 is being updated for the first time since 2005. Stay tuned! Project 50: The Grand Tour of America. Project 50 is one man's quest to see the United States of America. That man is I, Jim Poserina. The Project began on a sunny afternoon in June of 1999 in the city of Boston, Massachusetts. I was walking down Park Street with my best friend Vanya Cohen when, all of a sudden, I turned to him and said, "Hey V, take my picture. I'm going to take a picture of myself in front of all 50 state capitols." And thus Project 50 was launched. Successful completion of the Project requires 100 photographs: 50 state capitols, 50 state welcome signs. 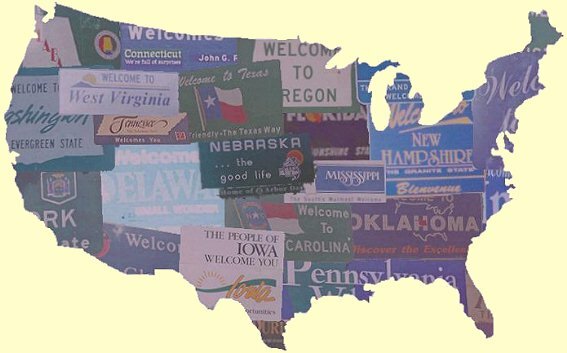 As of August 15, 2008, I have taken 87: 43 state capitols, 44 state welcome signs. This page loaded in 0.873 milliseconds.